Glaciers are always changing, always moving, even if we can't see it. I went to Mendenhall Glacier, just outside Juneau, Alaska, in early July 2011. Here's a picture. Observe the cool-shaped iceberg floating in the lake. To get a feel for the scale, look at the person in the foreground. When we went, the lake was full of ice that had calved off the glacier. Three years later, in late July 2014: Same glacier, same lake, almost no icebergs. Many, many factors are at play here. I just hope global warming isn't the main one. 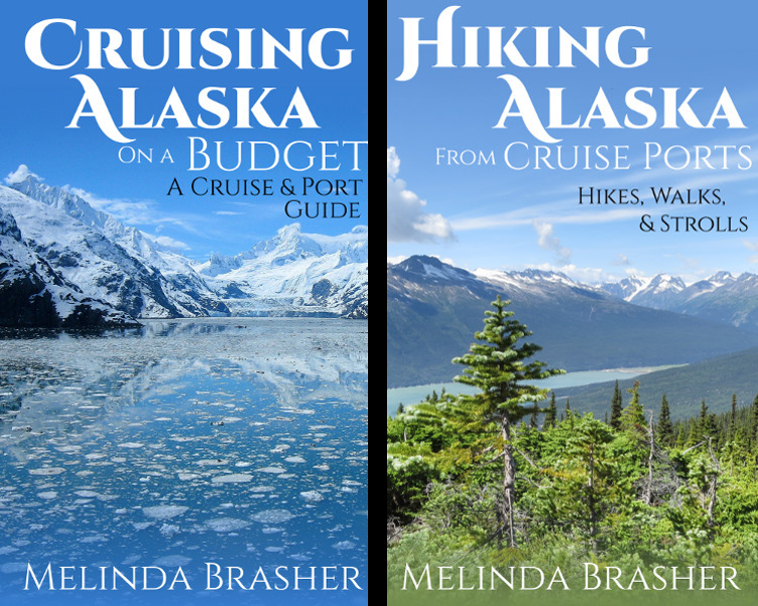 To learn more about visiting Mendenhall Glacier and other amazing Alaskan attractions, check out Cruising Alaska on a Budget; A Port and Cruise Guide. Whether you're thinking about taking a cruise or traveling on your own, you'll find useful travel tips for towns like Juneau, Ketchikan, Skagway, Sitka, and others. Buy the book now on Amazon. Sign up my mailing list in the right-hand corner. 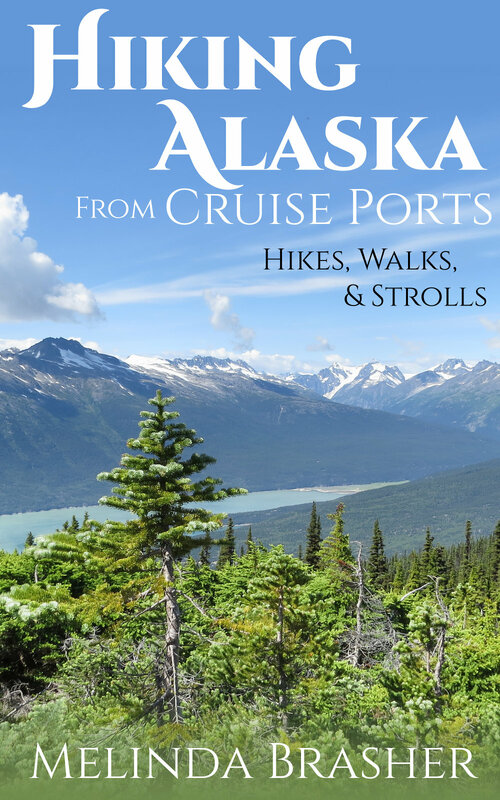 And if you're mostly interested in hiking--or strolling through nature--while you're in Alaska, whether on a cruise or not, check out my newest book. They are born in fresh water. They live most of their lives out in the sea. Then, when their biological clock tells them, they swim upriver, sometimes many miles, to the place where they were born, only to spawn and die. An amazing circle of life. Use the contact form in the right-hand column of this blog for more tips and Alaska news. A great Arizona hike--Picketpost Mountain, near Superior. The mountain stands alone, giving great views all around from the top. It's steep, the trail gaining more than 2100 feet (640 m) in about 2 miles (3.2 km). It's also a bit of an adventure: lots of rocks to climb over, lots of loose and slippery dirt, lots of places where you lose the trail and find it again after a little bushwhacking, lots of slightly scary heights. I LOVE it. To get to the trailhead, turn off Highway 60 not far east of Superior, Arizona. There are brown trail signs on the highway pointing the way. If you go, go in spring or fall. Absolutely do not try this in 100+ temperatures (38 C+) unless you really know what you're getting into. Even then, I don't recommend it. Take plenty of water whenever you go. Deer Mountain Trail is Ketchikan's most easily accessible trail, and it's certainly a beauty. Steep and often very wet, it's a lush and peaceful environment to enjoy some of Alaska's beauty. If you get high enough, it'll also give you great views. I've hiked it twice, and I would hike it again tomorrow if I had the chance. "The trail was wet wet--practically a river running down in. I had my emergency poncho (the heavy-duty one) but I was still immediately soaked from the ankles to knees and elbows to wrists. Then it started wicking up my sleeves and pant legs until I was completely soaked. My 'waterproof' boots stopped shedding water at about 1.5 miles, so my feet were in a swamp. But that made it easier to not care about the puddles and rivers. Adventure!" My advice: plan more time than you think you'll need, so you don't have to turn back before you want to. The trailhead is uphill along Ketchikan Lakes Road from the small city park. From the trailhead, it's 2.75-mile (4.4 km) climb to the 3000-foot (914 m) summit, but you don't have to go all the way to experience the greenery, the boardwalks, the views, and even the alpine meadows. You can get a basic map at the visitor center. 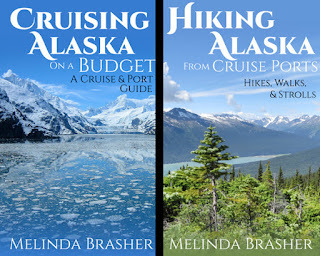 Do you want to know more about Deer Mountain Trail and other great hikes you can take while on an Alaskan cruise? 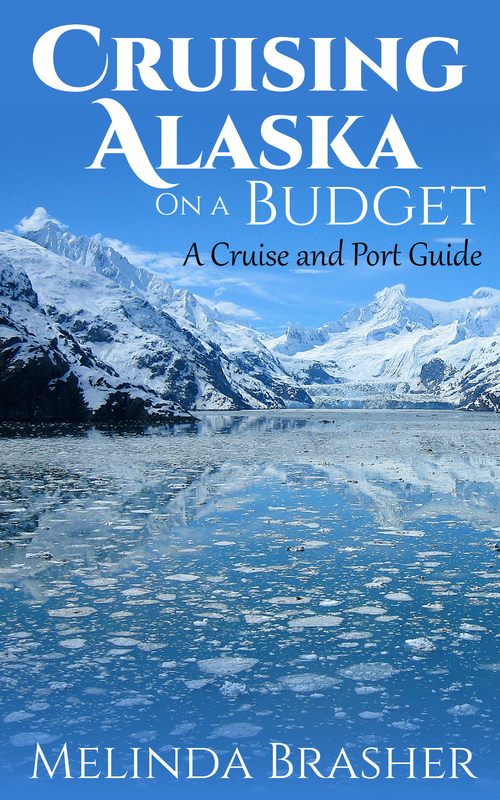 Then Cruising Alaska on a Budget is for you. It includes many free and inexpensive things to do in the ports, including hikes and/or easy walks in all the mainstream cruise destinations. If you're traveling independently, you'll still find the information useful. If you want to know more, sign up my mailing list in the right-hand corner. I love the Glendale Chocolate Affair, partly for the chocolate, but mostly for the writing classes (sponsored by area romance writers--see the connection to February and chocolate?) Every year I'm in the country, I go to some of the classes, and always learn something new or remember something I've forgotten. This year I collected my favorite tidbit of advice from each class and compiled them at Writer's on the Move, a blog I contribute to about the art and business of writing. This was a beautiful book. Sad, brutal at parts, but beautiful. It puts a very human face on the tragedy of war, and does so in a fresh way. The writing is at times too descriptive for my personal tastes, a bit too poetic, and I do sometimes wonder if someone who uses the verb “purl” twice within twenty pages is maybe trying a little too hard. 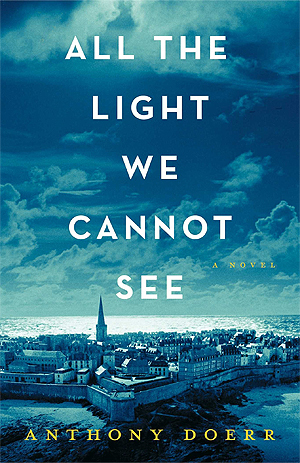 However, this is all very subjective, and overall I really liked and admired the writing itself: the velvety language and unusual combinations, the perfect choice of details, the slow builds. 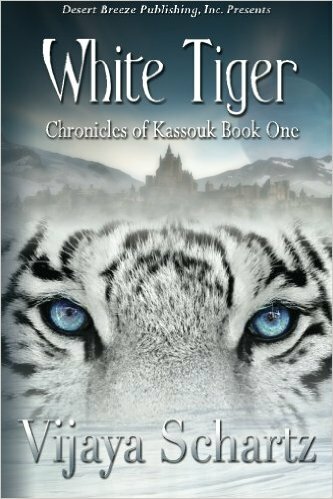 The main characters were well-drawn and I the author made me love them. The story moved slowly at times, but in that rich, beautiful way that I like. The plot was engaging, all the separate strands working well together. I did get temporarily confused sometimes with the time jumping because the author didn't always do enough to orient us at the beginning of each jump, instead just dating the sections and expecting us to remember the dates of the others sections. I never remember dates like that, so I had to flip back and forth a couple of times. Still, a minor issue. I did wonder about a few small details, like the can of homemade peaches. Wouldn't it be a bottle? A few things about the resistance's communication didn't quite make sense to me either, but that was probably just me. Again, tiny issues in such an good novel. The ending worked for me, though most if it was pretty sad. 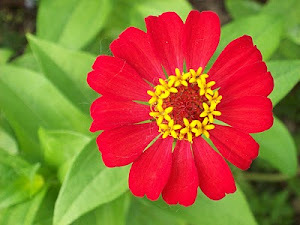 Yet amid all the sadness--through the whole book--there was hope and beauty too.